Mr. Michael Mangino, C.P.O., L.P.O., C.Ped. is both a Licensed and American Board Certified Orthotist and Prosthetist and he is also a Board Certified Pedorthist. He holds several patents in the Orthotics and Sports Medicine field. His research has been published and he has been interviewed by various journals within the profession. Mr. Mangino has specialized in Scoliosis for over 30 years and is proficient in several styles of conventional scoliosis bracing such as Boston Braces, Charleston Braces, Providence Braces, Milwaukee Braces, Wilmington Braces, Gillette Braces and several other hybrid models. For the last year he has collaborated with Grant Wood, C.O. who is by far the most experienced practitioner of Cheneau bracing in the United Stares. His Wood Cheneau Rigo Brace has been well documented in its capability of producing an outstanding three dimensional corrections in most cases of Idiopathic Scoliosis. Mr. Mangino and Mr. Wood have put on several Scoliosis Clinics across the United States and have collaborated at Scoliosis Conventions and have their work published in both books on scoliosis and in professional journals. Presently Mr. Wood has agreed to co-sponsor several Scoliosis Clinics with Mr. Mangino at Mr. Mangino’s New York Facility called Bay Orthopedic which he co-founder with his wife Carol who is also a Board Certified Orthotist. Mr. Mangino has served the profession as a co-founder and Board Member of the New York Orthotics and Prosthetics Association. During his eleven-year tenure with that organization he served as both a Corporate Officer and Chairman of the Continuing Education Committee. Presently Mr. Mangino is President of one of the United States’ largest and oldest Managed Care O & P Networks called P.O.M.A.C. (Prosthetics and Orthotics Management Associates Corporation) a corporation in which he was a co-founder. 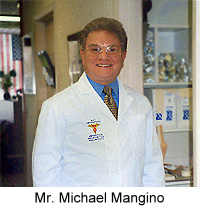 Mr. Mangino has also served as an instructor to several of New York's Universities both in undergraduate and postgraduate programs on the field of Orthotics and Prosthetics. He also routinely lectures to insurance companies and hospitals regarding the latest advancements in the field. Grant Wood, MS, CPO (UK), CO (US), is the co-founder of Align Clinic in San Mateo, California and has over 25 years of experience in the areas of prosthetic and orthotic patient care, management, product development, and scientific research. He is an active presenter, researcher, and winner of awards in prosthetics and orthotics. Grant Wood is also a specialist in scoliosis bracing with the Cheneau brace and the Rigo-Cheneau and RSC braces. He has the unique qualification of having trained and mentored with Dr. Rigo and Dr. Cheneau since 1996. Since then, Grant Wood has worked on numerous research publications, studies and workshops on the Cheneau and Cheneau Rigo braces. Grant Wood’s professional career as an orthotist and prosthetist spans work in the USA, England and Spain, where he worked for eight years at Group IDEO in Sevilla and Malaga. Grant Wood holds Bachelor of Science and Master of Science degrees from the University of Salford, School of Prosthetics and Orthotics in England. His post-graduate thesis was on idiopathic scoliosis treatment using the Cheneau brace at the Research Institute for Health, University of Salford. As well as being British certified in prosthetics and orthotics, he completed his American Board Certification in Orthotics, to become an ABC Certified Orthotist (CO) and US Board Certified in Prosthetics. In addition to his co-ownership of the Align Clinic in California he is a Senior Advisor to the Bay Orthopedic Scoliosis Clinic in New York.